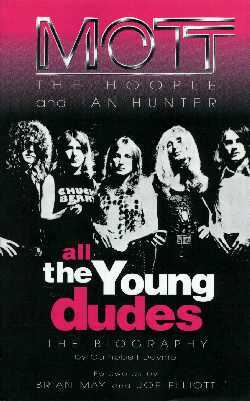 Mott The Hoople were one of the seminal British rock bands of the early 70's. Undervalued at the time, they have since been cited as major influences by members of Queen, Def Leppard, Oasis, REM, Kiss, Motley Crue and The Clash. In 1998, some 24 years after their demise they still had a loyal and fanatical following, so it was surprising they hadn't been covered in any great depth in the printed media. But then came the 3-CD Anthology and this biography. This, the definitive biography of Mott The Hoople and their vocalist Ian Hunter, finally puts that right. Written by long-time fan Campbell Devine, this book has been some six years in the making. Campbell has wisely avoided recycling old press clippings but has instead interviewed all the members of Mott The Hoople. The result is an entirely fresh treatment of the subject, and for that he is to be commended. Running to some 400 pages of close type, this book is no lightweight but is absolutely fascinating from start to finish. It traces the early (pre-Mott) careers of all band founder members, through their time at Island, their meeting with Bowie and the switch to CBS, the rise to international stardom and on to their break-up, their subsequent careers up to the present day. Fresh insights are provided into various aspects of Mott's career including much-debated topics such as Mott's break-up at the end of 1974, Ian's relative inactivity during the 1980's, and the chances (in the late 90's) of a fully-fledged reunion. It seems there is something on every page I didn't know before, so thorough is Campbell's research. This book is the most comprehensive work on the subject, and could well be the most detailed book written about any band. As such, it is essential reading not just for fans of Ian Hunter, Mick Ronson and Mott The Hoople but for the casual fan as well. Although they were interviewed extensively for the book, following publication both Dale Griffin and Overend Watts disowned the book and were scathing about it and the author. There are (supposedly) mistakes that they'd hoped would be corrected prior to publication and they felt the book concentrated too much upon Ian, making it more of a hagiography than a true biography. The book's author is clearly a fan and there is certainly a treasure trove of facts and trivia here, but he is not a professional author. The text is heavy going, and could do with the polish an established journalist/writer would bring. Don Arden, Don Powell and Lemmy all used professional writers to assist their autobiographies, and if ever there is an updated edition I think such a move would be of benefit here. Interspersing the text with contemporaneous photos would also help I think. Check out Slade's Feel The Noize (published in 1984, and written by rock journalist Chris Charlesworth), which was a joy to read from start to finish. I understand Campbell is working on bringing the Ian Hunter story up to date, possibly with a publication date of 2018, although whether this will be a treatise just of Ian or an update to this book I don't know. It's a Mighty Long Way Down Rock 'n' Roll. Covers the early careers of Mick Ralphs, Pete Watts, Dale Griffin, Verden Allen and Stan Tippins from leaving school until the end of 1968. The Loner. Covers the early career of Ian Hunter until the end of 1968. Little Flame, Tormented Soul covers Guy Stevens' career, Silence's career in early 1969, and their auditions for Guy Stevens. Two Miles From Heaven covers Mott's formation and their eponymous first album. When Both Of My Minds Have Gone covers the Mad Shadows album and tours in 1970. Maybe I'm Just A Loser covers the Wildlife album and subsequent tours, including their famous Royal Albert Hall gig in 1971. We Ain't Bleeding You, We're Feeding You covers the recording of Brain Capers, subsequent tour and 'split' early in 1972. I'm a Dude, Dad covers David Bowie's involvement with Mott and their successful tours of the UK and USA in 1972. Verden Grew a Line or Two covers the departure of Verden Allen in 1973. '73 Was a Jamboree covers the recording of the Mott album. I've Got To Move On covers Mick Ralphs' departure and the forming of Bad Company. Ladies and Gentlemen, The Golden Age of Rock 'n' Roll covers Ariel Bender, the Autumn 1973 tours of the USA and UK and the recording of the Hoople album. It's Got To Be The Greatest Show On Broadway covers Mott The Hoople's 1974 American tour and their historic shows on Broadway. Ziggy Played Guitar covers Mick Ronson's career up to when he joined Mott The Hoople. I'm Just a Marionette covers Mott The Hoople's European tour with Mick Ronson and their subsequent split. Trapped Halfway Up covers Ian Hunter's first solo album in 1975. Just a Whitey From Blighty covers Ian's second solo album All American Alien Boy in 1976. Don't Let Them Tell You That You'll Never Find Fame covers MOTT's career 1975-76. Can You Hear Us? covers Ian Hunter's Overnight Angels project in 1977. Give Me One More Chance To Run covers British Lions career from 1977 until their demise in 1979. Noises covers Ian's years with Chrysalis 1979-81. God Bless You, Guy covers Guy Stevens' career from his split with Mott until his death in 1981. Take Another Roller Coaster Ride covers Ian's career in the mid'80's, his All Of The Good Ones Are Taken album, and his movie soundtracks work. Never Too Small To Hit The Big Time covers Ian's YUI Orta album and tours 1988-1990. Michael Picasso, Goodnight traces Mick Ronson's final years until his death from cancer in 1993. Something To Believe In brings the story up to 1998 (when it was published), with recent Mott The Hoople releases and Ian's late-90's career moves. There are also over 40 rare/previously unseen photos covering all stages of the band's career.